Versatile in all styles, designer Tom Manche's attention to detail is evident in this contemporary U City condo. Contrasting with the kitchen’s streamlined cabinetry and range hood, a sinuous chandelier and wave-patterned rug add dynamic to the dining area. The entry foyer establishes the overall theme, with a contemporary chest, organic lamp, framed slices of natural stone and an area rug in shades of blue, green, purple and gray. The mirror-doored media cabinet is set against a curved wall, and a warm-hued rosewood cabinet provides storage for tableware and crystal. Rich color and natural accessories give character to the powder room. 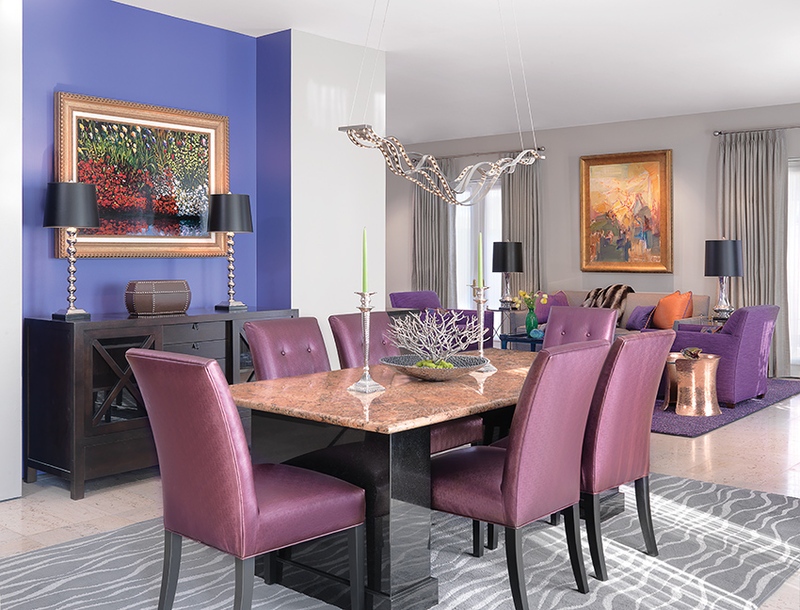 Unique copper accent tables, a blue-lacquered coffee table and abstract paintings accentuate the living room’s vivid color scheme. Serene in shades of gold, the master suite features a custom-upholstered bed, flanked by bamboo-styled tables and alabaster lamps. A seascape hangs above the hand-crafted, signed walnut table, and behind the bed, a floating wall conceals an office area. The suite’s comfortable sitting area is similarly furnished with organic and bamboo appointments. Shifting to taupes and blue-grays, the secondary bedroom illustrates Manche’s attention to detail. The throw pillows graduate from light to dark copper hues, complementing the cut-velvet bench, and the decorative lamps are a perfect match to the sleek, sculptural side tables. “Interior design is like a signed piece of art. Client satisfaction is, of course, most important, and I’m very detail-oriented. But as a creative, I like to think outside the box, to take risks.” That’s designer Tom Manche describing the “signature” philosophy that has contributed to the success of his award-winning, full-service design firm for two decades. Founded in 1997, Tom Manche Interiors is equally skilled in all design styles and has thrived on client referrals, handling projects from architectural drawings to the finishing touches. This two-bedroom condominium in University City, however, allowed the designer a unique opportunity to push his creativity to the limits. It was a high school reunion that reconnected Manche with the condominium owner several years ago. Not long after, the former classmate married, and he and his wife decided to raze and rebuild her home in Ladue, choosing Manche as their interior designer. The couple’s original plan was to sell the condominium, but Manche suggested refurbishing and retaining it as a corporate pied-à-terre for the husband’s visiting business associates. An added benefit, the couple could move into the condo while construction of their new home was in progress. Illustrating Manche’s versatility, the two projects represent both ends of the style spectrum. “While their new home will be strictly traditional, corporate condominiums are almost always contemporary. I wanted this space to feel like a modern hotel – exciting but tasteful, with unexpected color,” he explains. Renovation of the condo began in August of 2015, and five months later, it was ready to serve as the owners’ interim residence. Painted all-white, the interior walls of the two-story essentially gave Manche a “blank canvas” as a starting point. Basic spatial elements to be considered included an open floorplan, 10-foot ceilings and travertine marble flooring throughout the main level; 9-foot ceilings on the upper privacy level; and a TV room and half-bath on the finished lower level. With the exception of one sideboard, all of the furnishings were to be replaced, as well. Setting the stage, Manche chose a light dove gray for the main-floor walls and used the entry hall to forecast the ambience of this entire level. 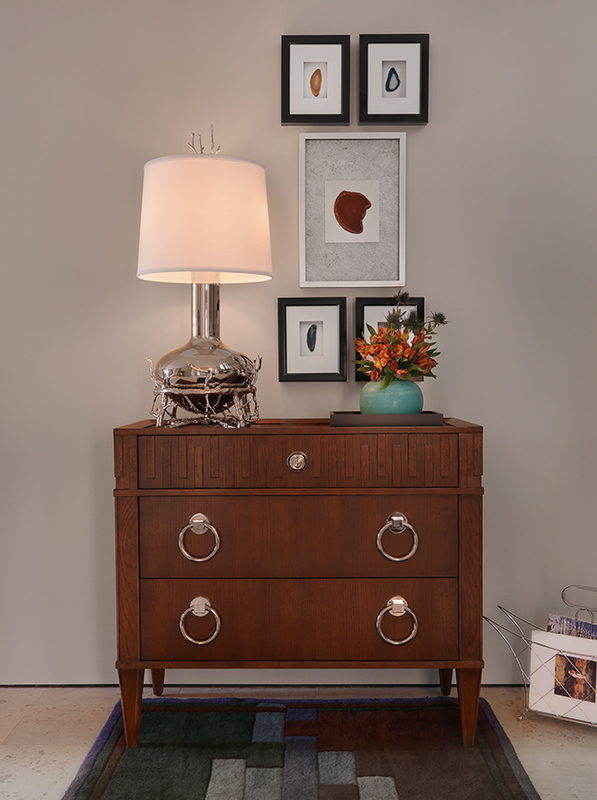 A contemporary chest with chrome ring pulls rests on an area rug in tones of blue, green, purple and gray, subtly establishing the overall color scheme. Framed slices of natural stone and a polished chrome lamp trimmed with metallic “roots” hint at the organic details that will become a recurring theme. Moving into the activity spaces, Manche’s use of color gradually intensifies, starting in the kitchen, where the streamlined cabinetry is a deeper shade of gray, complemented by granite countertops. A solid piece of soft blue, color-backed glass underscores the gray range hood; the island’s original glass top was replaced with granite; and a sink, dishwasher, wine cooler and microwave and warming drawers were added to make this feature more functional. One of the designer’s favorite pieces, a sinuous chrome chandelier draws the eye into the dining area, where a lightly textured area rug repeats the wave motif. 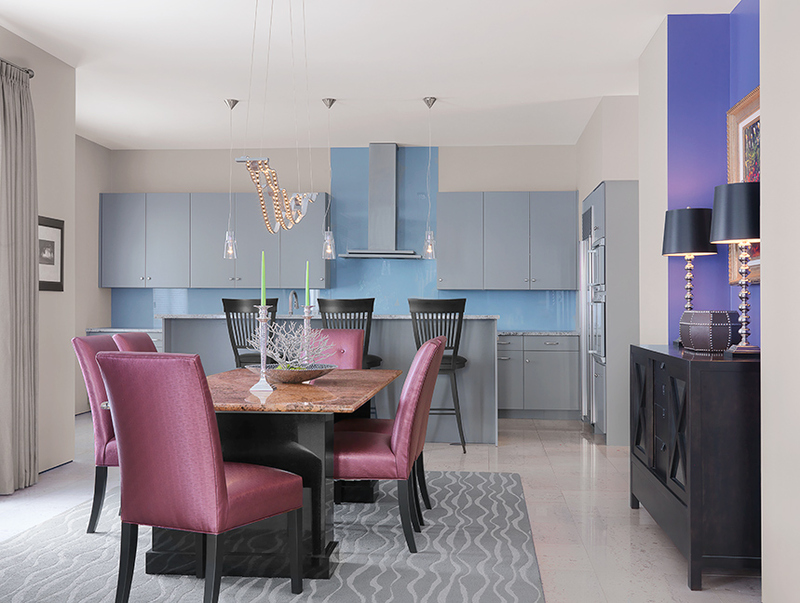 Positioned in a blue-purple niche are the owner’s dark-stained sideboard and two sleek lamps with black shades, prompting Manche to mention that “black adds a certain amount of sophistication.” The custom dining table is a terra-cotta granite slab, set on black granite columns to handle the weight, and light-plum chairs introduce the vivid purple tones that dominate the living room’s palette. 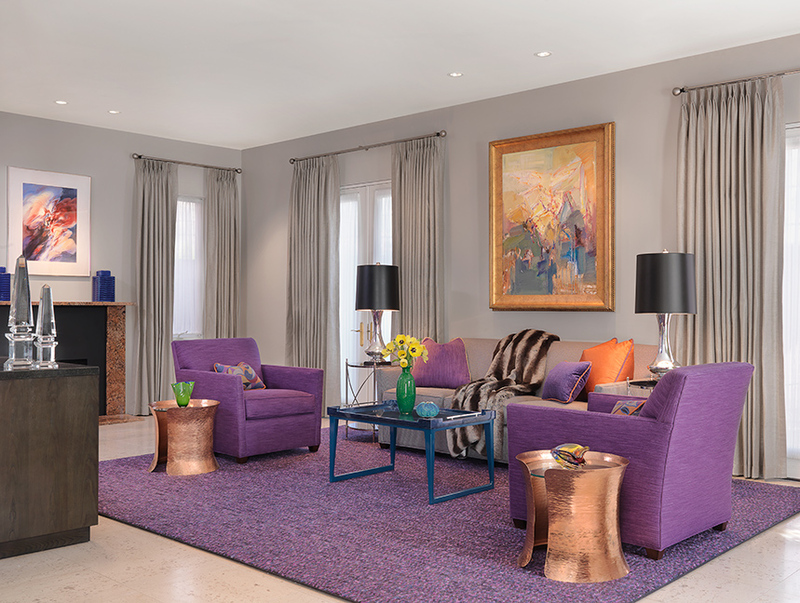 Ultra-dramatic with its striking amethyst hues, the living room’s side chairs are flanked by distressed copper tables, and decorative pillows, accessories and an abstract oil painting above the warm-gray sofa, provide vibrant orange accents. Another example of Manche’s attention to detail, the 36-inch fireplace seemed out of proportion with the room, so he added dimension by surrounding the hearth with surplus pieces of the dining table’s terra-cotta granite. 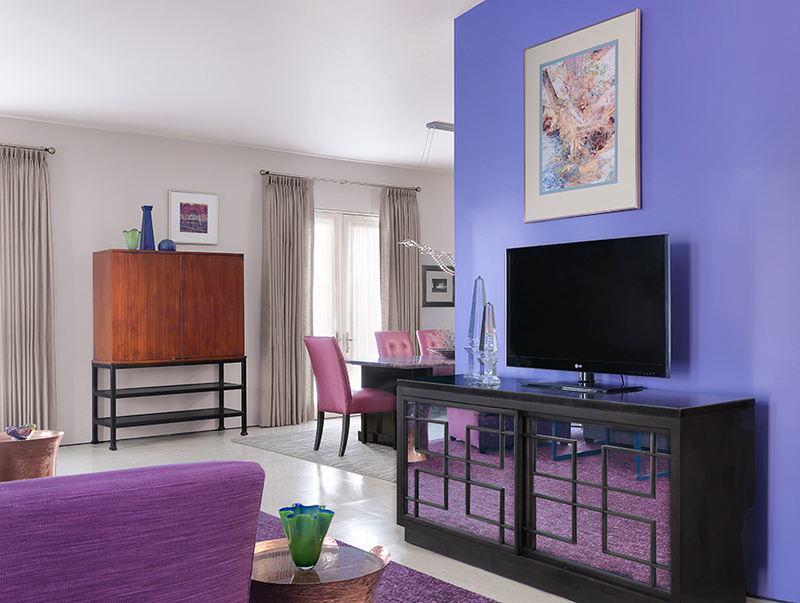 Against a curved blue-purple accent wall, the flat-screen TV rests on a contemporary black media cabinet with mirrored doors in a trellis pattern, and an opening was made in the wall to hide the wiring in an adjacent closet. Above this arrangement is one of three signed, organic watercolors that the designer found in an antique mall, reserving the other two for the bedrooms. Even the hall powder room makes a distinctive statement. 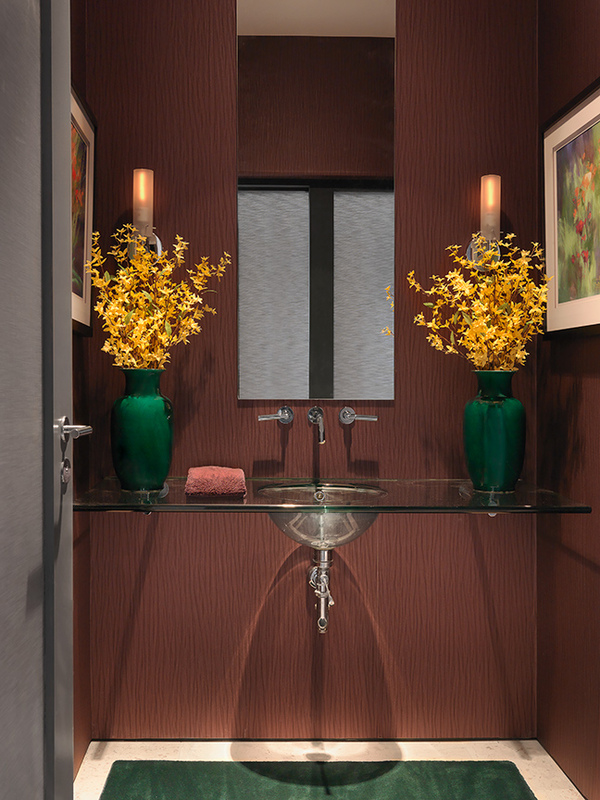 Textured, plum-colored wallpaper surrounds a clear glass, wall-mounted sink, with floral artwork, jade green carpeting and Chinese vases filled with forsythia adding natural accents. 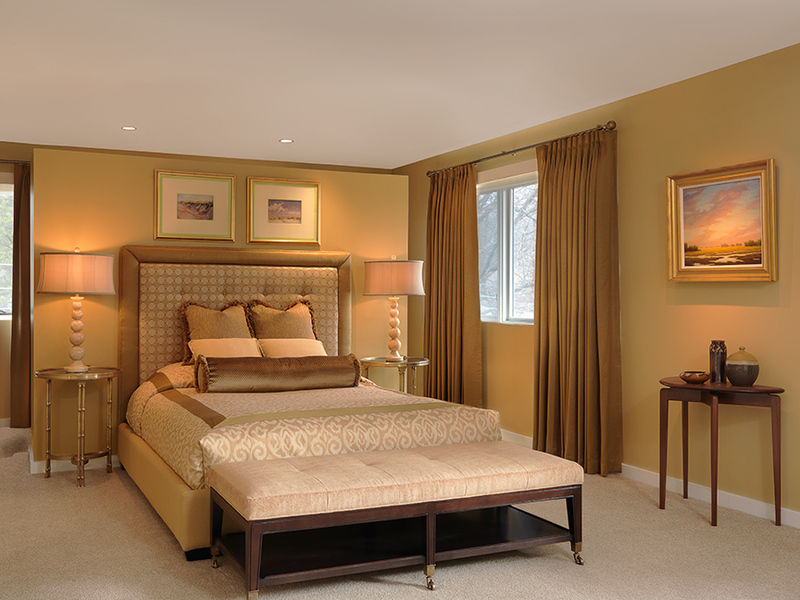 On the privacy level, softer, more muted hues restore a sense of tranquility for the bedrooms. In the master suite, various shades of gold are blended in the walls, upholstered geometric headboard, damask spread, and a tufted bed bench fitted with casters. Convenient for future corporate guests, a floating wall behind the bed conceals a small office area. Another of Manche’s design hallmarks, his bedding is always custom-made, and he prefers coverings that tuck into an upholstered base. The nature theme continues in the suite’s sitting area, where a watercolor river scene hangs above a glass-topped console table, arrayed with ceramic birds, lime green pottery and buffet lamps with satin brass bases resembling bamboo. 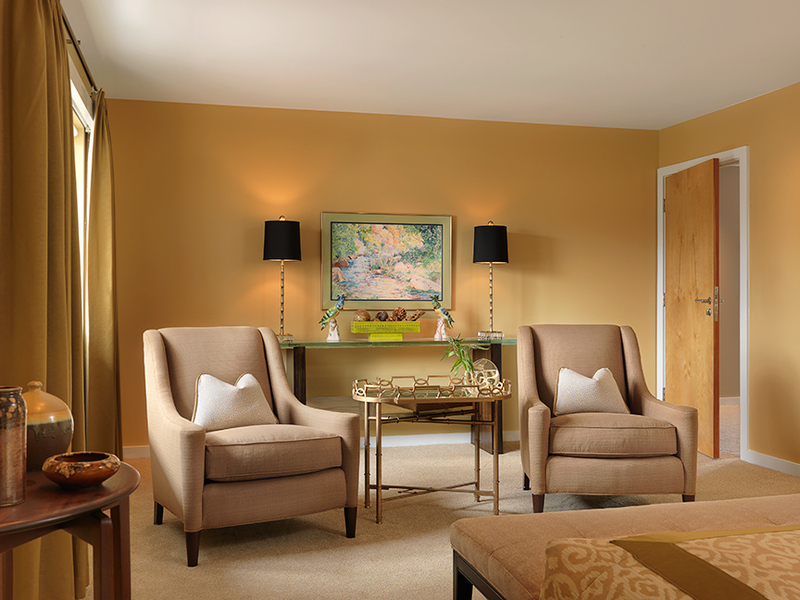 Clean-contoured club chairs and a bamboo-influenced accent table with mirrored top complete this inviting space. 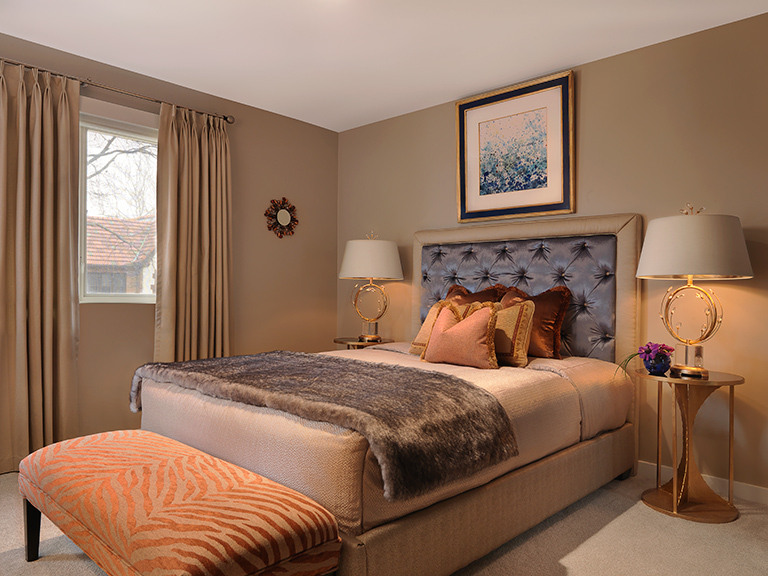 In the secondary bedroom, the color scheme transitions to serene taupes and grays, with tinges of blue. The shimmering blue-gray headboard is bordered in taupe; the bed cover has a silvery sheen; and a faux fur throw, zebra-stripe cut velvet bench and reptile-textured upholstery on the bed base are subtle reminders of nature’s wildlife. Among the designer’s special finds, the decorative lamp bases, trimmed in gold with crystal-tipped floral sprigs, are a perfect match to the gold-painted, sculptural bedside tables. Bold and dynamic, the finished condominium has a “wow factor” that’s sure to impress the owner’s future corporate guests. And with the couple temporarily ensconced in the condo, Tom Manche has shifted focus to their new custom residence. Although far more traditionally styled, his clients can be confident that it will be designed with flair – and, without doubt, impeccably detailed.